Time to take a look at some changes on how contracts work this week. 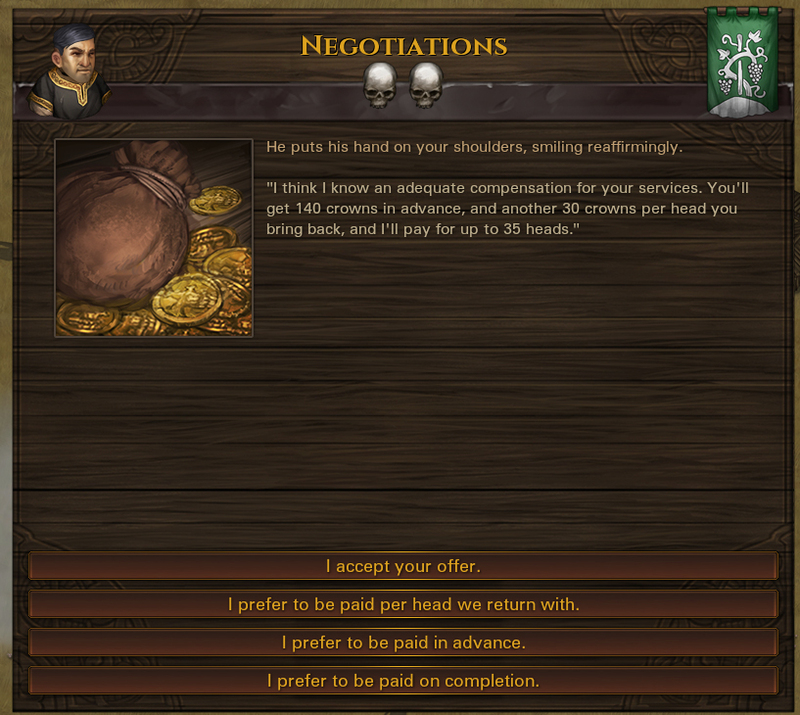 Negotiations have changed, and we’re introducing a new minor feature to make contracts and your actions within the world of Battle Brothers have more of an impact: situations. Let’s find out what that’s about! With your actions in the world should come consequences. As we’ve mentioned in a previous dev blog, contracts are now based more on what is actually happening around settlements and less on artificially spawning things for you to fight. Lots of greenskin activity in the neighborhood? Then there’s a good chance people want to hire you to take care of them. There’s direwolves roaming nearby? People are likely to want to hire you to hunt them down. We want to take this a step further. You know how the village burgomeister is telling you of how people are disappearing and that’s why he wants you to hunt down those beasts? It’s no longer just flavor as we’re introducing situations for settlements. A settlement can find itself in any number of different situations. 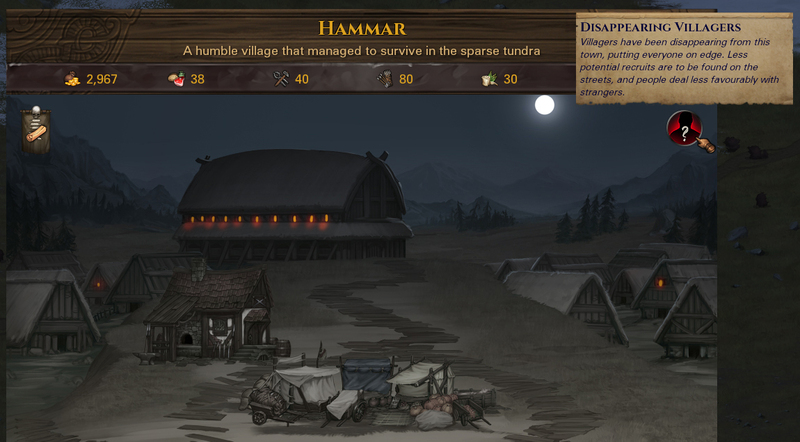 If there’s something roaming about, such as direwolves, villagers can be disappearing, which influences both the number of recruits available and the prices you get. As you take on the contract and rid the village of this terror, you’ll resolve the situation and the village can prosper again. Depending on your actions and success in fulfilling contracts, settlements can also find themselves in new situations. For example, your action of escorting an important caravan can result in a castle being freshly supplied, which grants you and everyone else a better selection of goods to shop for. On the other hand, if things don’t go as planned, a settlement can find its granaries raided or burned down, which makes food more rare and more expensive. While just a small feature by itself, introducing these situations contributes to your actions having more of an impact in the world of Battle Brothers, and it makes the economy feel less static as settlements have actual problems to deal with and benefits to gain from hiring you. In addition, having this system in place will allow us to potentially extend it in the future with situations not linked to contracts, such as the outbreak of a disease, for a more dynamic world. Here’s the thing: Negotiating contracts should be a part of gameplay, but the way it works now, you just ask for more money until the employer denies, and that’s it. It’s automatic, there’s little thought behind it, it’s not an interesting mechanic. So yeah, something needs to change. There’s two ways we could have gone about it: Either turn this into a more complex minigame of negotiating for better pay, or change it into something different. While the idea of creating a complex and fun minigame may be intriguing, it’s also not feasible within a limited timeframe and an already packed roadmap, so we went with the second option. Contract negotiations are now no longer about how much crowns you are to get, at least not directly, but about when and for what. There’s now a set amount of crowns per contract, depending on the type of contract, its difficulty, your renown and a small random factor. What you’re actually negotiating are payment modalities. What percentage is to be paid in advance? How much per head you return with and how much flat payment? Employers have their own thoughts on the matter, and you can ask them to pay out slices of the contract money in different ways. It’s no longer about getting a few crowns more or less in advance, it’s about whether you get half in advance or not. Sure you may not negotiate as often as before anymore, but if you do, it’ll be a much more deliberate action now. Hi guys – love the game! Here’s the thing guys: there’s NO reason in battle brothers I would ever want to get paid 100$ on completion if it can be 50$ upfront and 50$ on completion. If it’s the same amount, everyone smart will automatically take the “in advance” option, and if it really does come down to the same amount, there’s no difference between per head and on completion payout. Is there something I’m missing here? Or something you’re missing? By being paid in advance, you’ll get less payment overall. It’s a trade-off. According to the ingame tips if you abandon a contract that had upfront payment you get a bigger reputation penalty. So I prefer on completion payments in case i but off more than i can chew. You didn’t put much thought into your comment did you? The advantage of taking payment upon completion is that you won’t get penalized (as much) for abandoning the mission. A town can eventually be hostile toward you if you keep taking advance payments jobs but ditching. I can negotiate higher pay, but people will bne less happy with it and won’t spread positive word of mouth about my company as eagerly – thus with higher pay comes smaller renown reward. Also, maybe negotiate getting paid in form of supplies-in-advance rather than cash? Or payment in form of a single high-lvl item instead of money? Or if they have a temple, negotiate less money + free temple usage for a few days after completion. Way more interesting, and still relatively easy to implement. It’d be nice to have, but while ideas come easy, they aren’t necessarily ‘easy to implement’ just because they may appear that way from the outside. There’s a ton of things we’d like to put in the game, to continue to iterate and improve on, but we have a packed roadmap already and we can’t develop this game indefinitely. Some things have to give. Maybe reward/negotiation can include things other than money. 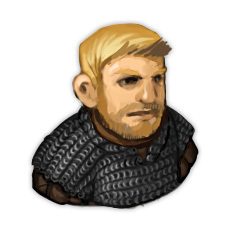 Maybe a letter of recommendation to the faction leader (bonus rep), a discount on goods available in the village/castle for X period of time, free equipment repairs if the town contains a blacksmith or even a rare heirloom weapon etc etc – it IS a barter economy after all. I’m very curious about how Battlebrothers and Harebrained Scheme’s Battletech will approach contract negotiations as both games are centered about running a sandbox mercenary company. According to some of the in game tips, if you abandon a contract that had an upfront amount you get a bigger reputation hit. Consequently i prefer all payment on completion in case i but off more than i can chew. I personally feel that this makes negotiations pointless for me. It might be useful earily game (first 3-5 days) when u need money in advance to get stuff and in ironman but without ironman i always complete my quests so if the negotiations won´t change the total gold i get, i don´t see the point to use it. This is just how it´s for me thou, cant speak for all, but would prefer some different approach. Is early 2017 still the planed relise date? The game is great, keep up the hard work. Looking forward to the next big patch release. In many cases, I’d prefer non-gold payments, especially late game. LOVE the situations! Give the actions of the mercenary company much more meaning, excellent!